CSUN is launching its 50th anniversary celebration of its Department of Africana Studies this month, which is also Black History Month. Each week in February, the department will host different discussions on issues prevent within the black community. 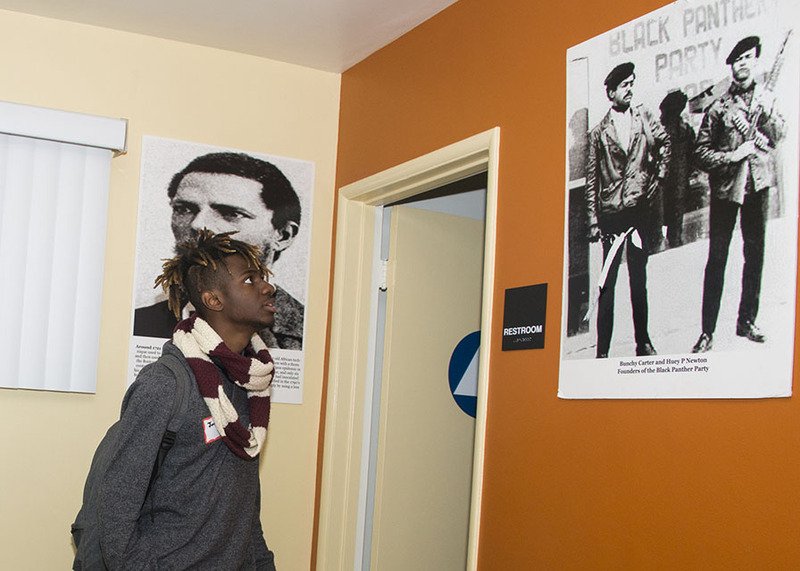 Above, a student admires the artwork on the walls of CSUN’s Black House. Photo by David J. Hawkins. Founded in 1969 during a time of great social change in the California State University system, the California State University, Northridge Department of Africana Studies is proud of its efforts over half a century to expand knowledge about black people in the United States, the Caribbean, Latin America, Europe and Africa from a culturally relevant perspective. This month, the Department of Africana Studies, part of CSUN’s College of Social and Behavioral Sciences, will commence its 50th anniversary celebration. The events and festivities will take place throughout Black History Month, with four themed weeks of lectures and artistic performances. In 1968, students led protests voicing their need for diversity on campus. Ethnic studies departments formed the following spring. Among the programs created were what are now called the Department of Chicana/o Studies and Department of Africana Studies. Each week in February, the Department of Africana Studies will host discussions on different issues prevalent within the black community. The week of Feb. 4-8 will cover the topic of “Health and Value of Black Studies Departments.” The week’s theme will aim to provoke interactive conversations to conclude with a program titled “Ancestors Drum: Black Folk Storytelling” held at CSUN’s Black House. The week of Feb. 18-22 will cover “Political, Environmental and Social Justice in Africana Communities.” The elements of political, environmental and social justice and activism will manifest through the rich story of Fannie Lou Hamer, with TED Talk speaker and activist Ronnie Finley. “The final week will address ‘Black Excellence and Athleticism’ and will offer a glimpse into the lives of those who have successfully woven together intellect and physicality, as well as those who navigate the intersection of the black and LGBTQ communities,” White said. The month-long celebration will be capped by a 50th Year Anniversary: Arc of Celebration black-tie reception at The Soraya Grand Lobby from 6 to 8:45 p.m. on Thursday, Feb. 28. Themes of the sessions and programs will include “Health, Wellness and Value of Black Studies,” where faculty and students explore the department’s historical legacy on the CSUN campus and beyond; and an “Awakening Consciousness Lecture” on nurturing souls through reflective conversation. 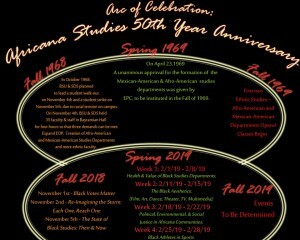 For more information on the Department of Africana Studies or the 50th anniversary events, email: Africanastudies@csun.edu.